Driven by both public demand and government regulations, pharmaceutical and fine chemical manufacturers are increasingly seeking to replace stoichiometric reagents used in synthetic transformations with catalytic routes in order to develop greener, safer, and more cost-effective chemical processes. This book supports the discovery, development, and implementation of new catalytic methodologies on a process scale, opening the door to the sustainable production of pharmaceuticals and fine chemicals. 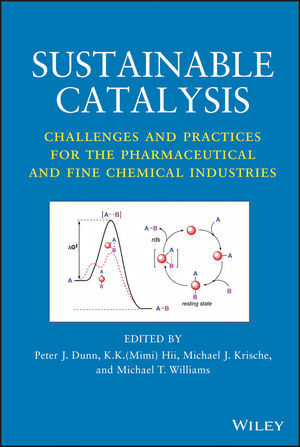 Pairing contributions from leading academic and industrial researchers, Sustainable Catalysis focuses on key areas that are particularly important for the fine chemical and pharmaceutical industries, including chemo-, bio-, and organo-catalytic approaches to CH, CN, and CC bond-forming reactions. Chapters include academic overviews of current innovations and industrial case studies at the process scale, providing new insights into green catalytic methodologies from proof-of-concept to their applications in the synthesis of target organic molecules. Offering a balanced perspective on current limitations, challenges, and solutions, Sustainable Catalysis is recommended for synthetic organic chemists seeking to develop new methodologies and for industrial chemists dedicated to large-scale process development. PETER J. DUNN, PhD, is Global Green Chemistry Lead for Pfizer. Dr. Dunn has played a key role in the development of commercial processes to make several drugs, including Viagra, Emselex, Revatio, and Sampatrilat. K. K. (MIMI) HII, PhD, holds a Readership in Catalysis in the Department of Chemistry at Imperial College London. Her research focuses on the development of sustainable catalytic processes for organic synthesis. MICHAEL J. KRISCHE, PhD, is Director of the Center for Green Chemistry and Catalysis and Robert A. Welch Chair in Science at The University of Texas at Austin. He is the recipient of the Tetrahedron Young Investigator Award, Humboldt Prize, Presidential Green Chemistry Challenge Award, and ACS Elias J. Corey Award. MICHAEL T. WILLIAMS, PhD, is an independent consultant. Previously, he was an executive director at Pfizer and played a key role in the development and commercialization of many drugs, including Zoloft, Viagra, and Relpax.